The PA600 portable terminal from Unitech is designed for users who need a compact, yet durable PDA for data collection and real time transactions. 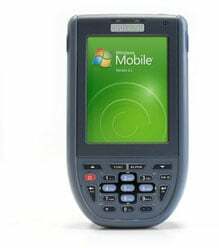 Powered by Windows Mobile 5.0, PA600 is equipped with a large color LCD touch screen, integrated laser scanner, 18 key keypad, and 520 MHz processor. When it comes to capturing data, the PA600 offers a variety of model options such as integrated barcode scanner, keypad, touch screen, and optional Bluetooth. With an IP54 rating to resist dust and water, the PA600 can also withstand 4-foot drops to a concrete floor. Barcode Compare (With History) Software for the PA600. Operator scans the first barcode and then the second barcode. Device will indicate whether the codes are a match or do not match. Display on the device will also show a log of what has been scanned thus far in the session. Includes installation and one hour of support. The Unitech PA600-9660EADG is also known as UNI-PA600-9660EADG	or PA6009660EADG	.